I finally got around to the latest Fall to Layout yesterday. It was fun to create a circle card instead of the traditional square or rectangle card. 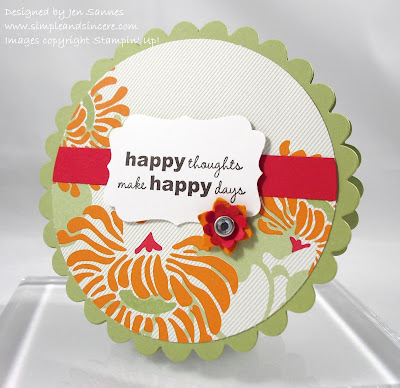 I decided to make mine using my Scallop Circle die with my Big Shot. To make the card, I cut a piece of Pear Pizazz cardstock at 5 1/2" x 8 1/2" and folded it in half, just like making a traditional card. I placed the folded cs on my die and cut it so that the fold would be at the top of the card. I then took another piece of Pear Pizazz and cut a second scallop circle, which I adhered over the top of my card front. This way you don't see the flat fold at the top, just the scallop. You'll find all the other supplies listed below, as usual. I'll back tomorrow with another card to share - see you then!